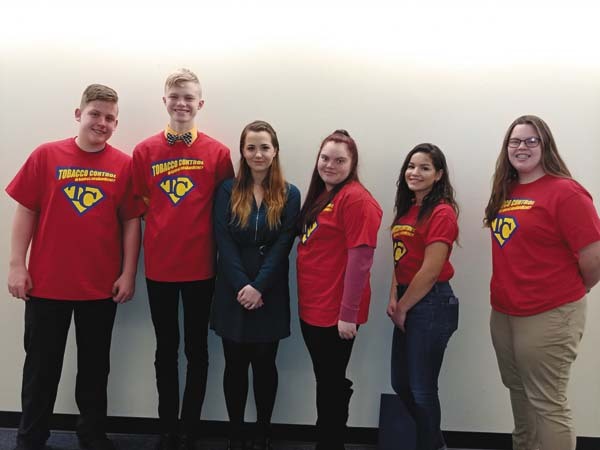 JOHNSTOWN — Advancing Tobacco-Free Communities and Reality Check youth leaders from Fulton County recently returned from the state Capitol in Albany where they met with state lawmakers representing the area, according to a news release. 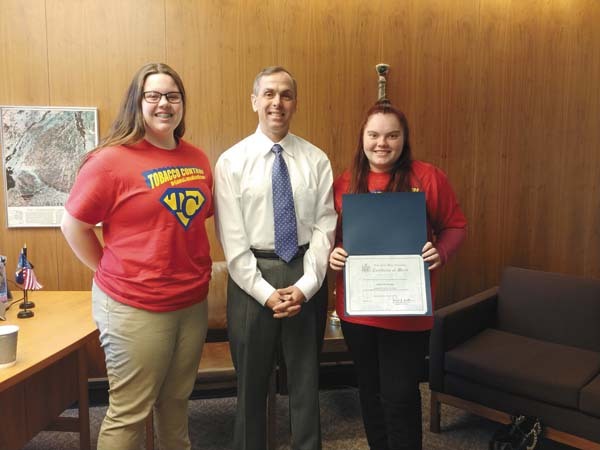 Morgan Rossi from Broadalbin-Perth High School and Aislynn Ward from PTECH talked with Assemblyman Robert Smullen, Sen. George Amedore, Sen. James Tedisco’s legislative aide and Assemblyman Angelo Santabarbara’s legislative liaison about the success of the tobacco control program at helping lower the statewide smoking rate. The youths also talked about the unmet needs in tobacco control efforts, particularly among highest use communities. Throughout the state, just over 19 percent of those who earn less than $25,000 a year and who have less than a high school education smoke cigarettes, as do 26 percent of those who experience poor mental health. “We’ve made great strides in combatting the tobacco epidemic, but more work needs to be done to reduce the significantly higher smoking rates among disparate populations in our region and throughout the state,” said Sarah Kraemer, Reality Check coordinator. The average adult smoking rate has dropped to a historic low of 14.2 percent in New York. The New York State Tobacco Control Partners have contributed substantially to the drop in tobacco use rates among adults and youth around the state through policy-driven, cost-effective and evidence-based efforts. These approaches are now being focused on communities and populations with high tobacco use rates. Another population that warrants attention is youth. Cigarette smoking among the state’s high school youth declined 82 percent between 2000 and 2018, but from 2016 to 2018 the rate increased slightly for the first time since 2000. Even more alarming, electronic cigarette use among the state’s middle and high schoolers continues to rise. Between 2014 and 2018, the rate increased by 160 percent, from 10.5 percent to 27.4 percent, and studies show e-cigarettes can be a precursor to cigarette smoking in youth, even those who were not likely to smoke cigarettes. More than half of teens falsely believe e-cigarettes are harmless, but adolescent nicotine exposure can cause addiction, it can harm the developing adolescent brain, and it can increase the risk of adolescents starting and continuing smoking combustible cigarettes.